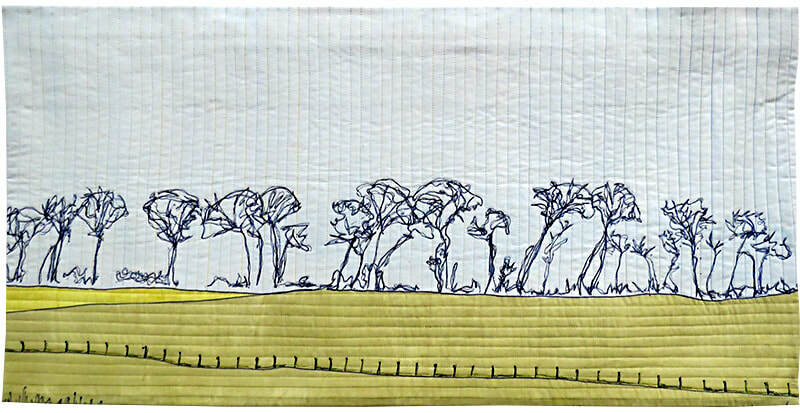 Quilting is not usually a spontaneous artform. Making quilts requires forward planning, often with a liberal dose of staying power. One might think that this was not the ideal medium to capture a moment in time. 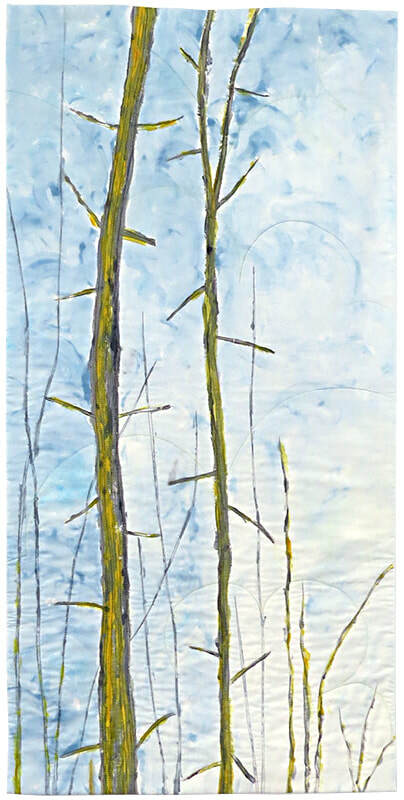 But in the exhibition Stone + Water + Wood, on display at the Festival of Quilts this year, three well-established quilt artists have drawn on many years of expertise to produce works that demonstrate both control and freedom to create personal snapshots of the natural world that inspires them. United by friendship and a love of landscape, Susan Denton, Janice Gunner and Cherry Vernon-Harcourt live in different parts of the country: Susan in Cornwall, Janice on the London/Essex border and Cherry in rural East Anglia. They are drawn together by their quiet contemplation of the world around them and their ability to home in on details, sometimes interpreting them in the form of abstract patterns and sometimes in a more directly pictorial way. 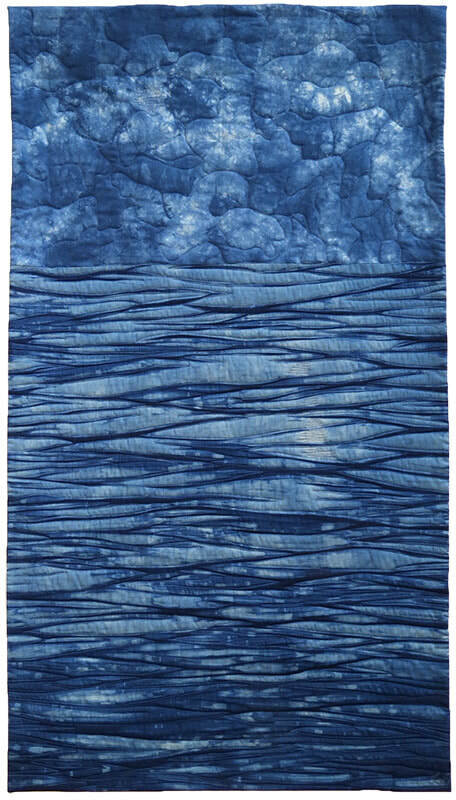 Janice is well-known for her use of indigo shibori dyeing to produce patterns reminiscent of ripples. 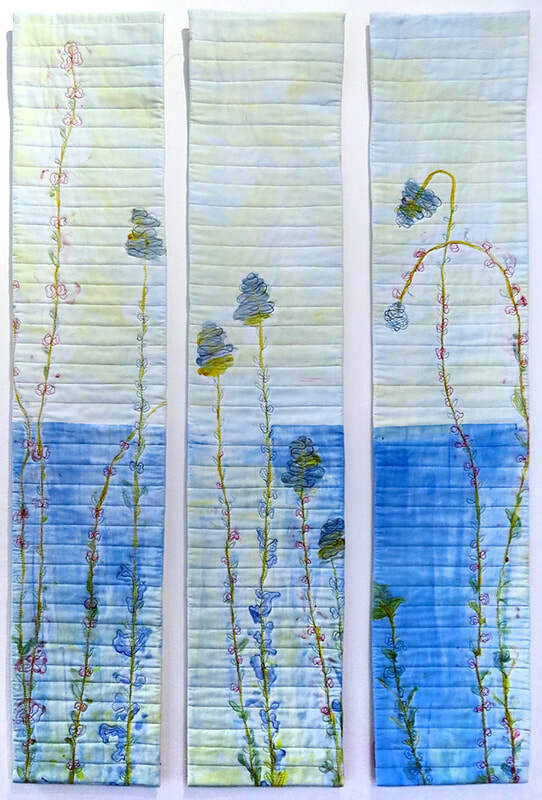 She enhances these with machine-stitched lines, sometimes using metallic thread to provide a dash of sparkle to indicate light bouncing off water. Like Cherry, her work combines elements of control and randomness. Some of her pieces consist simply of the rippling shapes and in others she has introduced geometric features. These take the form of perfect circles and uncompromisingly straight lines that would never be seen in nature. 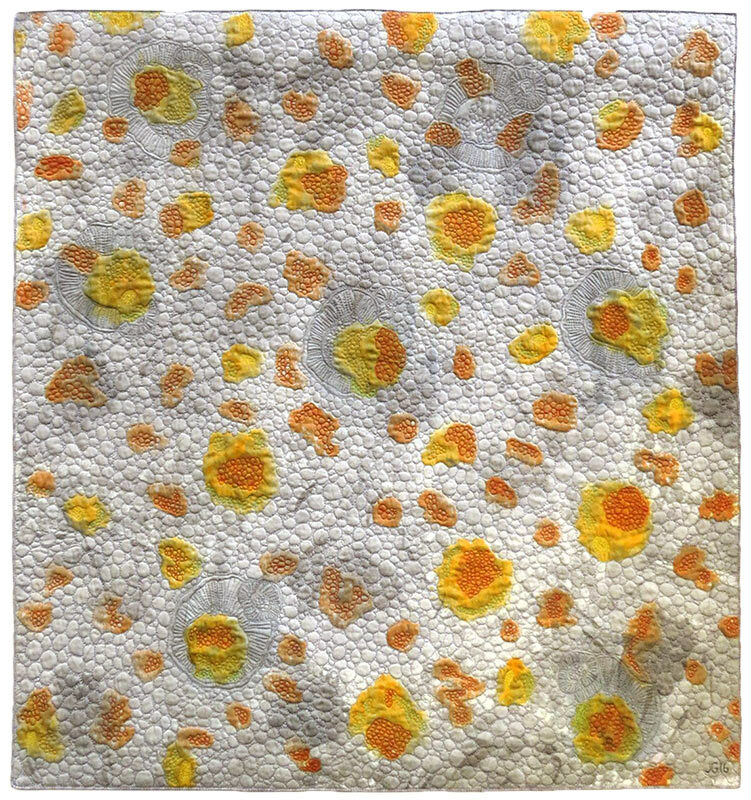 In ‘Watery Worlds’ a panel of large pale spots is enclosed in a border of ripples. In ‘Summer Blues’ a small rectangle is picked out inside the larger frame – all with the trademark ripples but varying in scale. The viewer feels the gaze being pulled in and out of focus, echoing the fleeting nature of the waves. These are accompanied by two pieces on the theme of lichen. 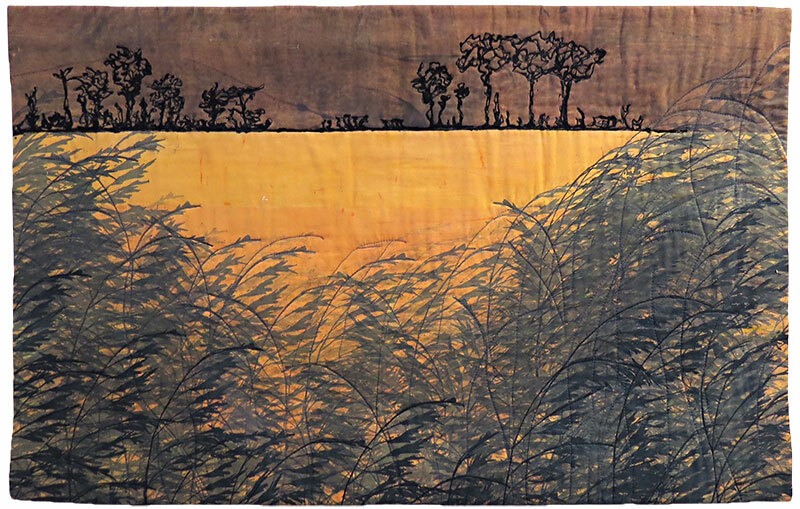 Here Janice uses different colours – yellows, ochres and greys – and different techniques – dye painting and screen printing. Again, she concentrates on pattern: this time the irregular, organic and vaguely circular shapes in which lichens naturally grow. 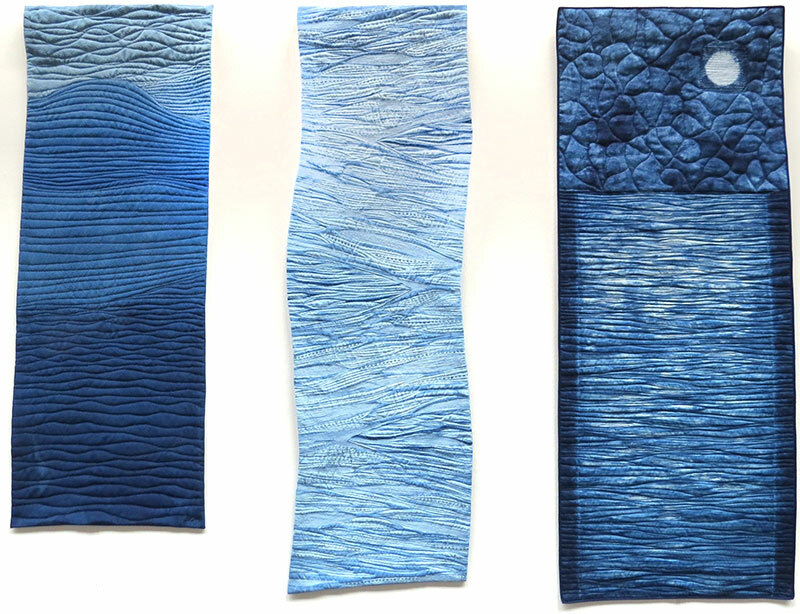 These two pieces are more densely stitched and, one senses, more carefully planned in that they rely less on the serendipity of shibori dyeing. The background machine quilting in small pebble shapes suggests the stone on which the lichens grow. 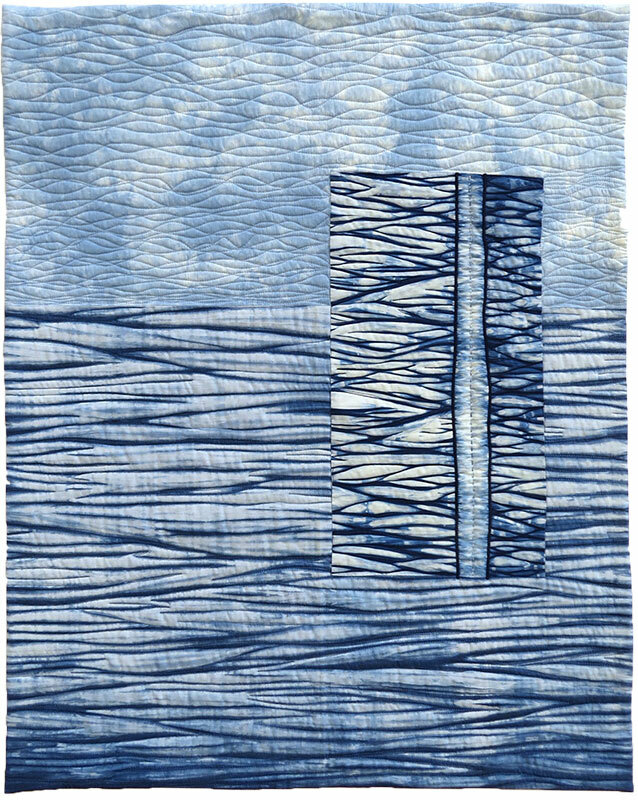 Compared with the indigo pieces, these quilts feel earthy, organic and tactile. Susan Denton’s work is inspired by the area around her home in the far west of Cornwall, a wild landscape of unpredictable seas and stark rock formations as well as more gentle fields, footpaths and flowers. 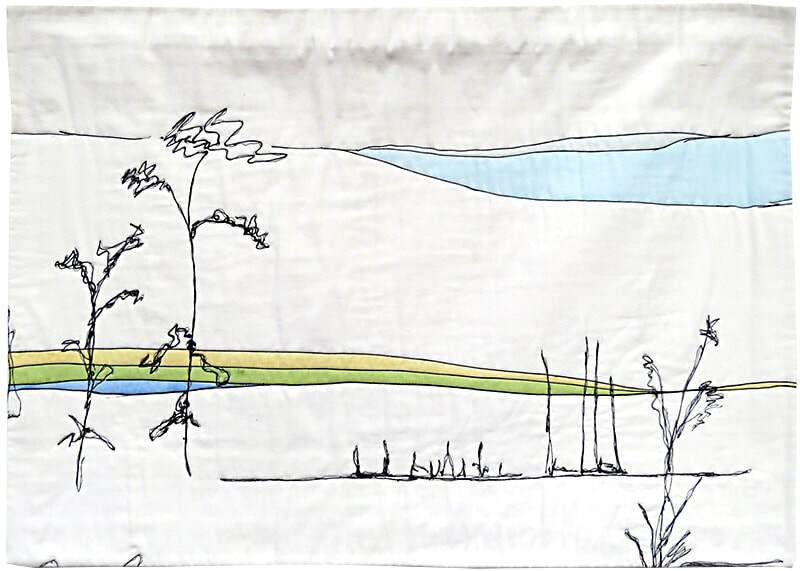 Susan is renowned for her precisely executed machine-pieced quilts in which natural features of the landscape, such as hills and valleys, are rendered in carefully chosen fabric shapes. 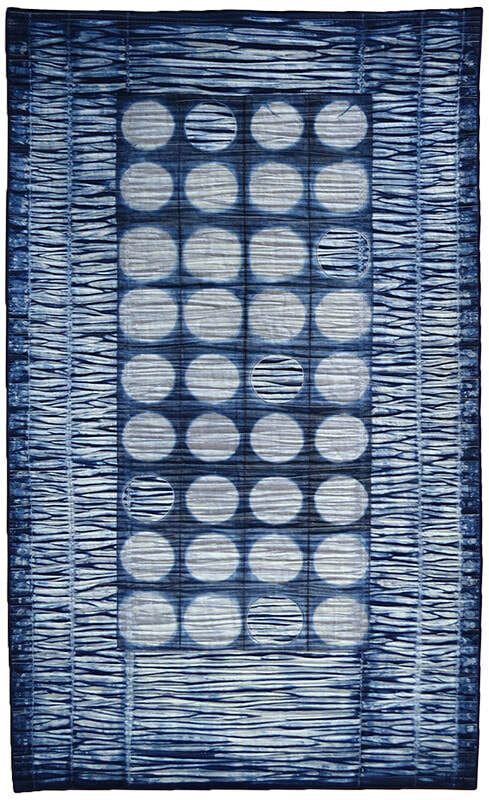 She overlays these with hand-stitching to create texture which either complements the design or adds extra elements to it. My Place 2, Beneath the Walls looks to the world beneath her feet where a seam of amethyst lies and imagines a matrix of interlocking fractured and splintered rocks revealing tantalising hints of this purple stone. This is a visually dramatic piece, as is St Valentine’s Storm, which arose from a particular event: a damaging gale along the coast in February 2012. Large grey shapes in straight lines enclose the sweeping curve of a single wave picked out in darker fabric against a lighter centre, all covered with lines of hand quilting in thread that sometimes blends and sometimes contrasts, adding to the sense of movement. 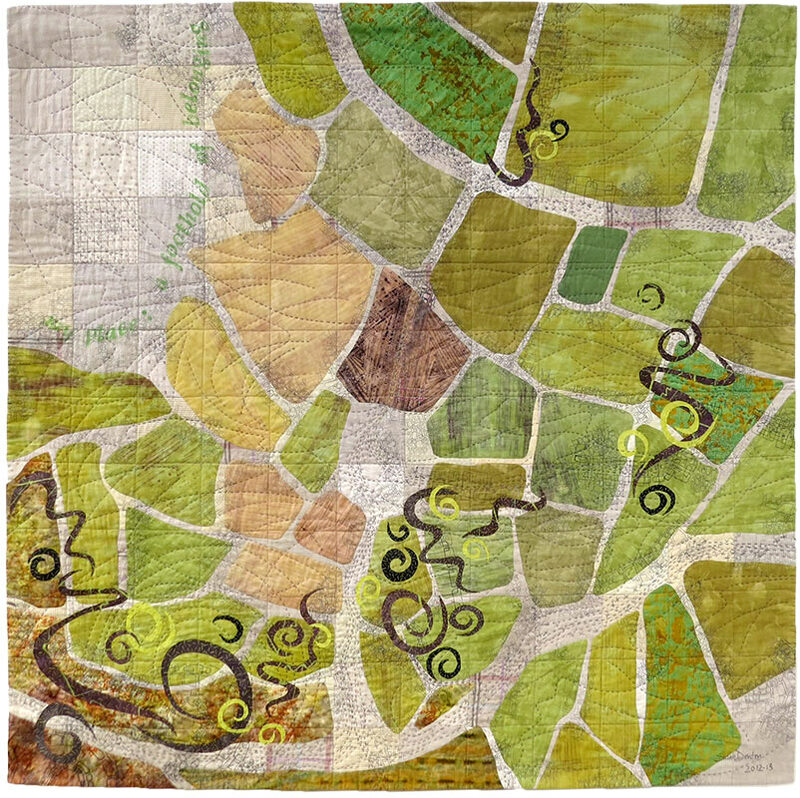 A Foothold of Belonging is a quieter piece: an aerial map of field patterns in a variety of pale greens and browns showing the footpaths and walks with which Susan is familiar. Closer inspection reveals lightly printed elements suggesting dry-stone walls and hand-stitched lines perhaps depicting well-trodden and familiar paths. 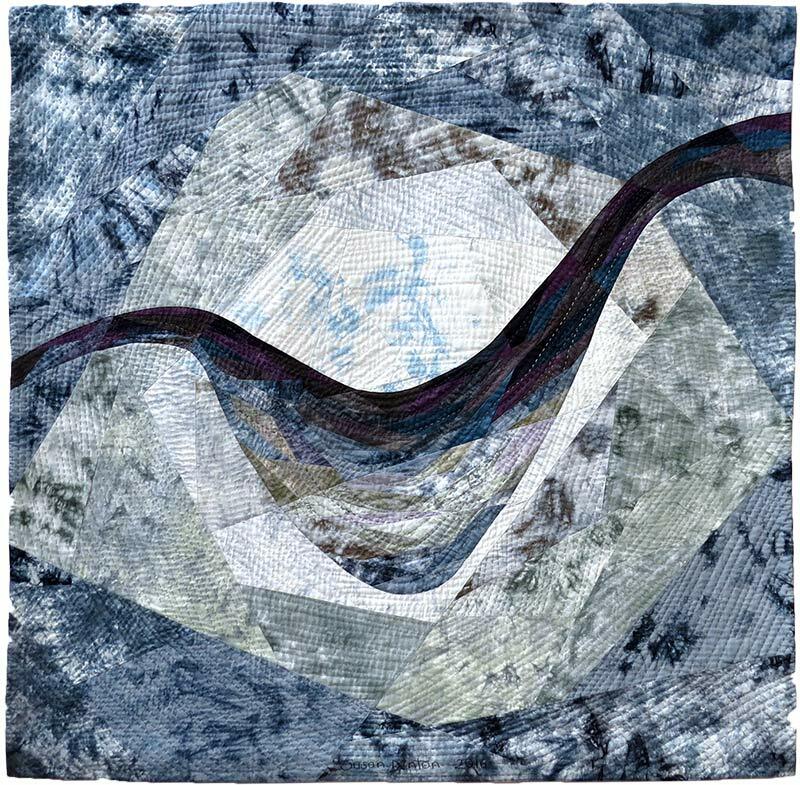 Towards the bottom of the quilt, a series of spiral shapes held down with seed stitch add an element of unpredictability. 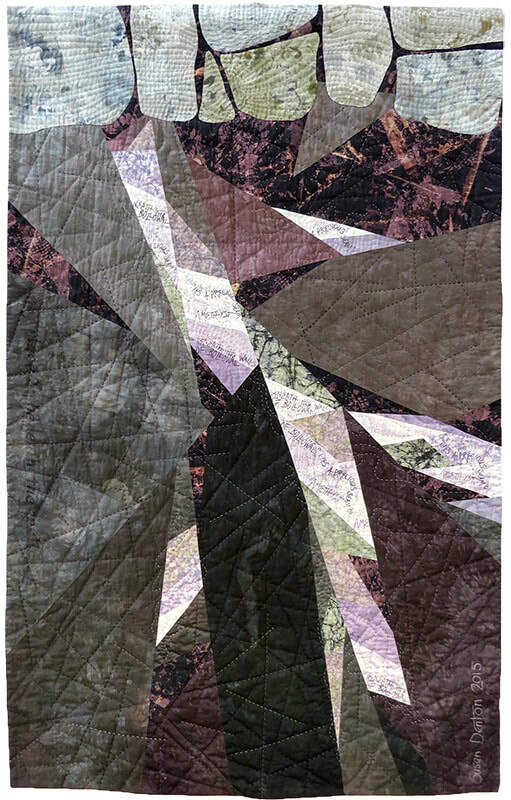 The common factor in these quilts is their muted natural colours, and the exhibition worked as a harmonious whole. 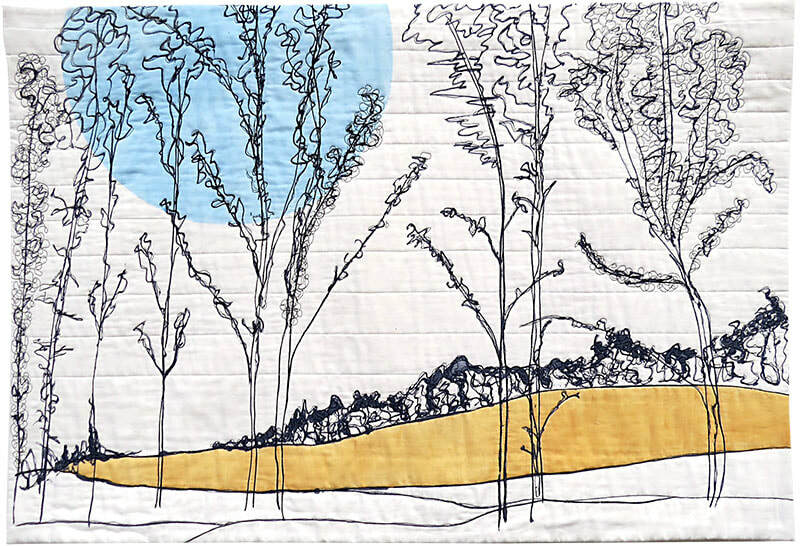 These artists show that the slow and labour-intensive nature of quiltmaking can sometimes be combined with an element of improvisation to produce works that encapsulate a single moment in time and space.